Many companies—manufacturing, metal fabrication, construction, or otherwise—still regard forklifts and lift trucks as the de facto means of material handling. They are relatively inexpensive and readily available, and training operators takes little time. But, while a forklift can get you from point A to point B in most any setting, it can’t always meet the lift needs of your application. In many factories, space is limited, so using forklifts for material handling purposes can be quite dangerous. What little floor space is available may become a potential home for new machinery or staging for work-in-progress. In these cases, a portable lift system or overhead bridge crane can be the perfect solution for your lifting needs. But, what if you’re looking to purchase a flexible overhead crane system without having to retire your forklifts entirely? Forklifts do serve an important purpose in many applications, and retiring equipment prematurely is not cost effective. Many applications in manufacturing, construction, and packaging require the transfer of small and repetitive loads in versatile settings. What if you could use your forklift while gaining the flexibility and versatility of an overhead crane system to maximize space, improve usability and safety, and increase productivity? In these situations, a portable freestanding workstation jib crane may be the best possible solution. Jib cranes are widely used in multiple industries and applications due to their ability to maximize space, offer unrivaled clearance above and below the boom, and provide 360-degree rotation. Workstation jib cranes are designed with trussed enclosed track and a sturdy mast for lifting and transferring loads up to 1,000 pounds. These nimble, lightweight cranes are faster than motorized jibs and can provide an easy ergonomic material handling solution for applications where gantry cranes are not an option and forklifts are in constant use. Portable freestanding workstation jib cranes are easily transferred from one part of your facility to the next or from site to site. Their unique design includes counterweight bases with forklift pockets, which allows workers to lift the jib crane quickly and easily using a forklift and move it wherever it is needed on site. For applications requiring long reach and 360-degree rotation, Spanco’s standard portable freestanding jib cranes can reach spans of 16 feet with up to a 1,000-pound capacity. When portability is an important factor, workers are generally lifting lighter loads in tight spaces. These tight spaces can cause major safety concerns, as most workplace injuries are due to improper or repetitive lifting in inappropriate positions. Investing in a portable workstation jib crane provides workers with the means to lift safely and can, in turn, decrease worker downtime and improve productivity. 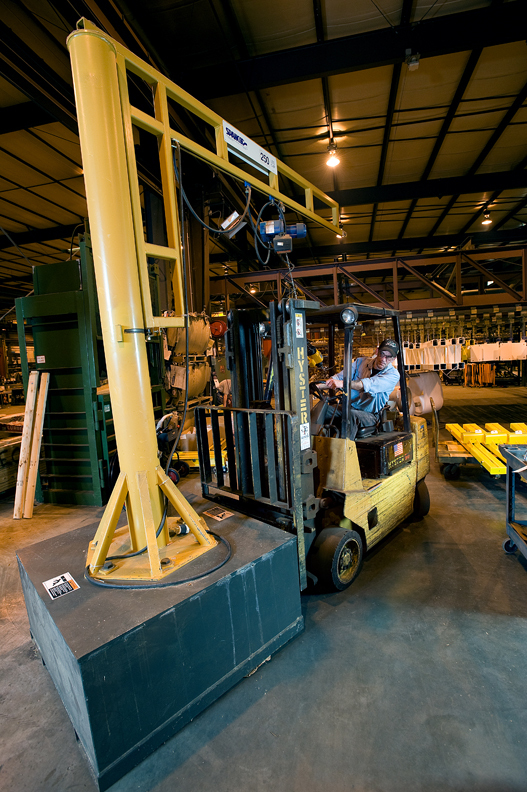 Forklifts fill an important need on many factory floors and jobsites, but they can also disrupt production and require special training to operate. Adding a portable freestanding jib to your arsenal will not only provide workers with the right tool for the job, but it will also provide 360-degree circular coverage, a safe and ergonomic lift solution that works alongside your forklifts, and the type of portability other cranes cannot provide.